Pi day… one of those obscure holidays that is just fun to celebrate. I remember celebrating it and Mole day (10-23) in high school each year in my math and science classes. Then, my brother got married on Pi day. They went so far as to get married on March 14th at 1:59pm so that it would be 3.14159. Great idea, right?! So let’s all be a little quirky together and celebrate pi day by exploring math, numbers, and measurements with our children…even our toddlers! Bake and Make it all About Math! 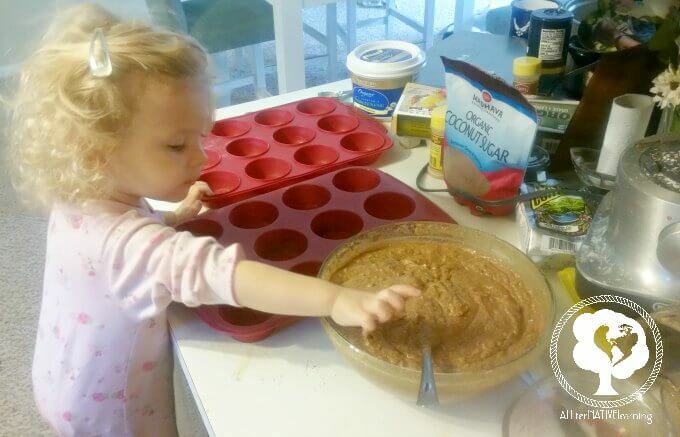 Of course, you should definitely bake a pie with your little one and let them help you in the kitchen. Even if you choose not to make a pie, muffins or cupcakes work just fine and you can still talk about circles! In baking the pie, take time to explore early mathematical concepts like measuring and time. In the process, they can review some of the awesome learning themes they have already done like measurement, kitchen, shapes, patterns, and more! They can help scoop out and measure ingredients and pour them in the bowl. They can choose a blender speed by identifying numbers on it. Toddlers can also help set the timer for how long the pie should bake. Your child can help cut the pie in to even size pieces to explore early fraction concepts. And if you’re really brave, eat the pie and talk about the concept of zero (none left). You might be surprised at the conversations you can have with toddlers about this stuff. So why not?! 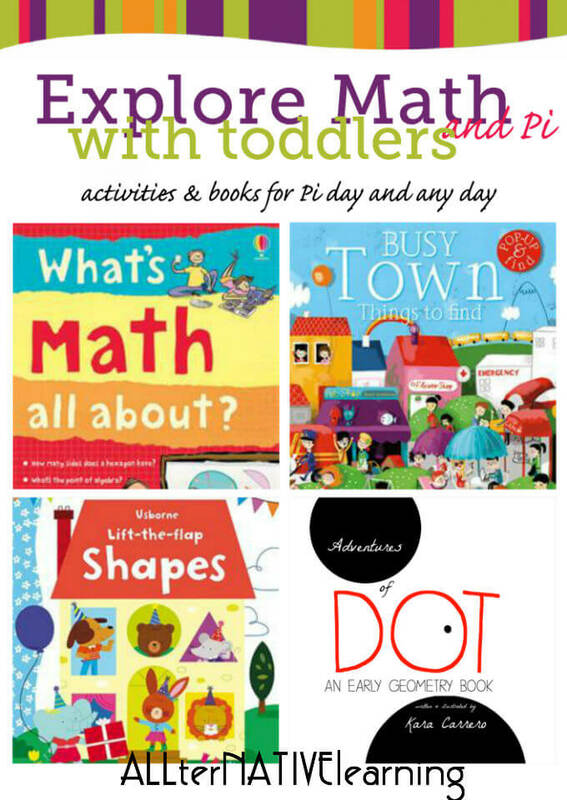 Once you have made your pie, cuddle up with some awesome books to help get your toddler interested in math, numbers, and patterns. Explore Shapes! Make each meal to be completely circular like a sandwich on circular bread with circular cheese. Even mention how a cup’s opening is circular. Make and play with a pattern busy bag! Play any game that requires a round ball. 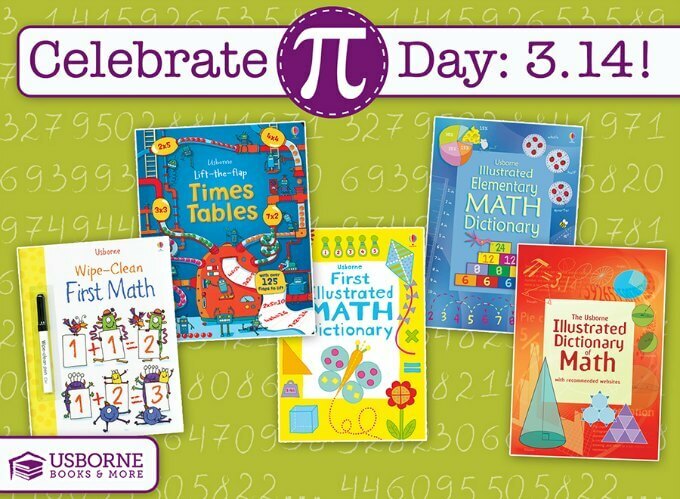 No matter the age of your children, there are some awesome books out there to celebrate math and pi day. This is because everything from shapes to patterns to time include mathematical concepts. Even listening to music is a mathematical language in sorts because chords, notes, and octaves create ratios in sound (mind blown, right?!). So take the day and explore the wonderful world around you in a whole new way. Explore how everything is math in some way. While most of the books mentions are from Usborne Books & More, I also included my own children’s book! Adventures of Dot – this is a book I wrote that is just a simple introduction to shapes, numbers, how shapes are formed, and just the simple adventures of a little dot. Lift the Flap Shapes Book – Because Pi is the ratio of a circle’s circumference to its diameter… it is something that only applies to circles. So this would be a fun time to look at shapes in general, but most notably, circles. 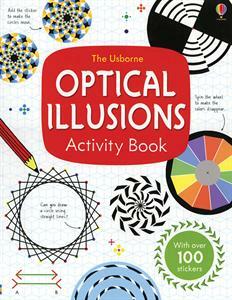 Optical Illusions Activity Book – Again, this book has a lot to do with shapes and circles, but also patterns is a key concept in early math skills. So this is just a really unique and fun way to explore patterns through optical illusions. Busy Town – This cute little book promotes counting which is an early math concept that even toddlers can love. Go through this book counting all the little birds! First Numbers Sticker Book and Wipe Clean First Numbers – work on both counting and identifying numbers with both of these first numbers books. We adore wipe clean books because they are reusable and wonderful. As an extension activity, see if your toddlers can identify each number in pi (yes, it’s infinite, so maybe just 314159 since those are the most often used digits in mathematical computations. Telling the Time – Clocks are circles, they have numbers on them, and it’s pretty much infinite… so why not look at clocks to celebrate pi day?! What’s Math All About? – Just a fun book to read about math and even about some of the historical figures that were great mathematicians. In reality, our world would not be the same without great thinkers in the field of math. It’s required for everything in some way shape or form! First illustrated Math Dictionary – Probably geared more for older toddlers, but still a great resource to have on hand. Sometimes my toddler and I just love to sit down and look at children’s dictioanries and explore pictures and discover what each thing means. It’s just a simple way to learn and have fun with your kids. More Toddler Learning & Tot School Themes or even have me host an Usborne Books & More Party for you on FB!